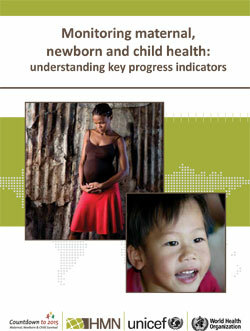 Countdown to 2015, in partnership with the Health Metrics Network, UNICEF, and the World Health Organization, has launched a new report that aims to help chart advances in maternal, newborn and child health in high-burden countries. Monitoring maternal, newborn and child health: understanding key progress indicators was released at an international stakeholders meeting on implementing the recommendations of the United Nations Commission on Information and Accountability on Women’s and Children’s Health, in Ottawa on November 20th through 22nd, 2011. “Without information, at country level, we can never have accountability. Without information, we can never know what a ‘best’ or a ‘wise’ investment really means. Without information, we are working in the dark, pouring money into a black hole,” said Dr Margaret Chan, Director-General, World Health Organization in her address to the meeting. The report summarizes the main opportunities and challenges to effective monitoring of 11 select, core indicators of maternal, newborn and child health in the 74 countries that account for more than 95% of the world’s maternal, newborn and child deaths. The publication explores the extent to which health information systems in these countries are currently able to report on the indicators with accuracy, frequency, timeliness and quality required. The report then provides descriptions of each of impact and coverage indicator ? for example, maternal mortality ratio, exclusive breastfeeding up to six months or antibiotic treatment for childhood pneumonia ? and discusses data sources and areas of potential improvement. The two financing indicators for resource tracking and the feasibility of disaggregating data by key dimensions of equity, such as wealth quintile, gender, age, urban/rural residence are covered. Improving policy-makers’ capacity to use the data reported to strengthen programme management and ensure resources are allocated most appropriately.